This Monday, IDW Limited will be offering up a few limited edition type things as part of their Cyber Monday event, and among those things will be 25 sketch cover editions of TMNT: Secret History Of The Foot Clan drawn by this handsome guy right here (me). 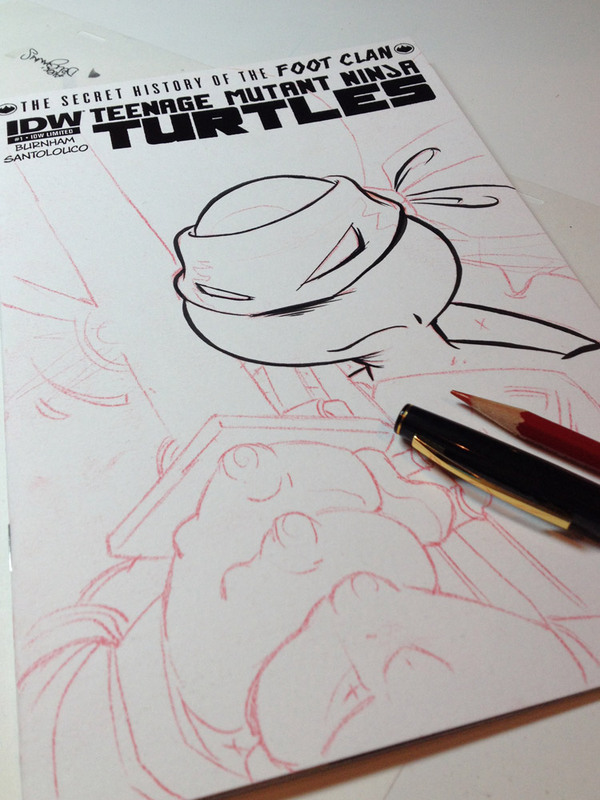 These sketch covers are one of three separate (but related) TMNT projects I've been drawing in recent weeks, so it's been nothing but ninja teens on my drawing board of late. I did feel turtle burnout creeping in once or twice, but at my core I'm still the same little fat kid who used to spend his recess redrawing Eastman and Laird panels, so I can't even pretend it's been anything but great fun. I especially enjoyed this project because, despite all my years of loving and drawing these characters, I've never felt like I fully figured out my own personal take on them. Somewhere in the midst of doing these covers, I think it came together. I'll get into details of the other two projects later, but for now I thought I'd share some process pics, and give you a look at what you'll potentially be getting yourself into if you decide to snag one of these. I'm either about to lure you all the way in, or convince you to slip that benji back into your pocket. When I first opened the package from IDW, seeing all those blank covers was a little intimidating, to be honest. They asked me to do up one full cover to begin with, so that Nickelodeon could give their approval before we went further. I sent them my first, cover, featuring Leo, and once they approved it, I was off to the races. The first cover I did for this series. Real comic book artists sign on scrolls or tattered paper. Just a fact. One big happy family. Soon they'll be broken up forever and sent off to new homes. IDW will be selling these for $100 a pop on Monday morning at 10:00 Pacific sold out of these suckers in 10 minutes (!) via their IDW Limited site. I'm not sure if buyers will be able to pick the cover they want or if it will be a blind buy, but I really tried to give each cover the same love and attention. The goal in the back of my mind while working on these was that everyone would be happy regardless of what they find when the postman drops off the package, and I sure hope that's the case. If you get one, please do let me know!